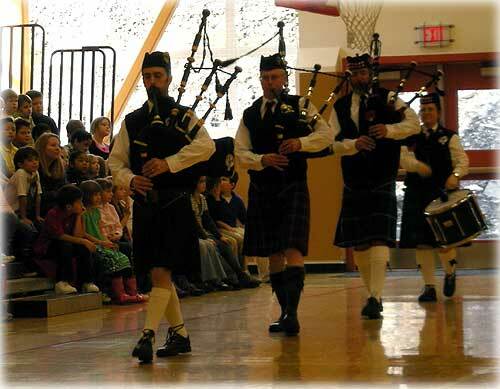 Members of the Misty Thistle Pipes & Drums performed a "Thank You" concert for the student body at Fawn Mountain Elementary last Wednesday in recognition of their canned food drive. Fawn Mountain classes collected over 2,500 cans which were delivered to Love, Inc. Fish Factor: Global recession takes a bite out of wild salmon prices By LAINE WELCH - The global recession took a bite out of wild salmon prices this summer for both fishermen and processors. Although the coast wide supply increased by 16.8% over last year, the average dock price of $.51/lb. was a drop of 20.3% - but still an improvement over the $.44/lb. average in 2007. According to Seafood Trend's Ken Talley all but sockeye salmon prices had double-digit declines at the docks this year. King salmon took the biggest hit - the average price of $2.62/lb was a drop of 42.3%. Coho prices averaged $.86/lb, a drop of 32.8%. For chums, the average dock price dropped to $.44/lb, down from $.59/lb. Unfortunately, the huge drop in the pink salmon catch couldn't offset the bad economy - pink prices fell to $.22/lb. this year, down from $.35/lb. in 2008. Alaska's most valuable salmon -sockeye - accounted for about 56% of the total value of this year's catch. The average dock price (before any post season adjustments was $.80/lb down only 4.8% from last year and exactly the same as 2007. On the bright side, Talley said the lower prices kept wild salmon in front of consumers all summer, when farmed salmon were short and high-priced. Talley predicts that helped prime the pump for a market that could be ready to boom as the economic recession tapers off next year. Alaska: Governor's Coordinated Transportation Task Force Releases Draft Report - The Governor's Coordinated Transportation Task Force (CTTF) has released its draft recommendations report for public review and comment. The 39-page draft report describes the state of special needs transportation in Alaska, challenges to coordinating funding and services, and recommendations for meeting those challenges. Members of the task force are asking agencies, individuals, organizations, tribes and communities to submit comments on the draft report to the task force. These comments will be considered in preparing the final report to the governor in January 2010. Ketchikan: Youth-Driven DIY Heavy Metal Concert Combats Breast Cancer - Bras were flying, long-haired guitarists were shredding, and corpse-paint was everywhere to be seen at Halloween 2009's BreastFest -- a youth organized heavy metal show. Six youth bands united to raise over $400 for the First City Council on Cancer. Funding will be used to assist local residents undergoing breast cancer treatment. The bands performed at the stARTled Salmon -- a Ketchikan-based recording studio / record label / community arts space. Pariah, Buck Up Little Kamper, Damaged Justice, Pink Cloud Project, Demophat, and Peter Jacob were all in top form, delivering everything from Slayer covers to original songs dealing with challenging issues such as child abuse and smoking cessation. The teen-dominated audience ate it up, and also ate up the delicious BRA-ts (bratwurst) offered for sale. Brandon Hoyt, drummer for Buck Up Little Kamper, summed the event up, saying: "This was the best time we've ever had at a concert. Ever." Southeast Alaska: 'Timely Snapshot' of Second-Growth Timber - A project designed to give Southeast Alaska communities a better understanding of the timber value in the region's second-growth forests has received a contribution of $2,500 from The Nature Conservancy. The $2,500 grant helps the Southeast Conference, a regional economic development non-profit, pay for a "young-growth timber cruise" on the southern portion of the Tongass National Forest. The timber cruise is expected to provide a timely snapshot of the current value of the young-growth forest in the region. This grant is one way for The Nature Conservancy to help Southeast Alaska communities have better information at hand as they plan second-growth timber management in the future. Alaska Science: Quiet time on the sun stalls aurora viewing By NED ROZELL - It's a slow season for aurora watchers, due to an extra-long quiet period on the great aurora generator-and all-around giver of life-the sun. Poul Jensen of Fairbanks took this photo near Old Murphy Dome Road on an exceptional aurora night from Oct. 29-30, 2009. "For two years we've been in an unusual, very low, extended solar minimum," said Dirk Lummerzheim, an aurora forecaster at the Geophysical Institute at the University of Alaska Fairbanks. "That has an effect on aurora because aurora activity follows solar activity. The aurora hasn't been too exciting lately." Like the booms and busts of snowshoe hares, the numbers of both solar flares and sunspots (dark splotches on the sun) peak about every 11 years. On the other side of that peak is a crash, and the sun has bottomed out in sporadic activity since early 2008. The sun has gone more than two years without spewing a significant solar flare, and sunspot counts have also been very low. And sunspots are not great aurora indicators anyway. Alaska: FIRE SAFETY FOR THE HOLIDAYS - Cooking and heating-related incidents are the leading cause of residential structure fires in Alaska, accounting for almost 75% of the state's total reported residential structure fires. With the holidays approaching, warm, cozy homes and holiday feasts play a major role in our preparations for family gatherings. It also increases the risks for fire. These fires can be prevented and losses reduced by simply following a few simple safety precautions. .